Activist and author Ayaan Hirsi Ali (far left) faced off against three critics and a hostile moderator at the Women in the World New York summit on April 7. New York was recently the scene of a heated debate on the status of Muslim women under Islamic law. In it, one of the bravest women in the world, Ayaan Hirsi Ali, faced off against three other Muslim women and a hostile moderator, Barkha Dutt. Dutt, known for her soft spot for Muslims in her own country of India, identified so much with the three Muslims attacking Hirsi Ali the New York Times mistakenly described her as a Muslim, reporting four powerful Muslim women had faced off against Hirsi Ali. (The paper later issued a correction). 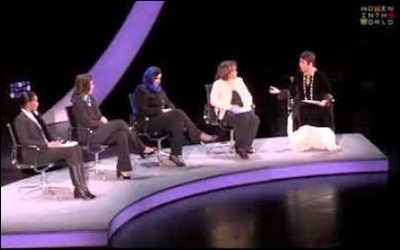 The debate, hosted by the group "Women in the World,' started with Dutt telling the packed audience that in her opinion all religions were misogynist and thus it was unfair to focus only on Islam. The debate opened with the moderator telling the audience all religions are misogynist. To reinforce her argument, Dutt equated the actions of Islamic fundamentalists to Republican presidential front-runner Donald Trump, saying: "What he (Donald Trump) said about women, according to me, is so much worse, so much worse than the Muslim fundamentalists he seeks to keep out of the United States of America." Then, turning her guns on Hirsi Ali, Dutt asked: "There are so many misogynists and they belong to so many different religions, why are you picking only on Islam?" Hirsi Ali immediately recognized she was being set up to run a gauntlet of criticism and so chose to go for the jugular. I reject Islamic law because it's totalitarian ... because it's bigoted and especially bigoted against women... Where Islamic law becomes the law of the land ... women will need a male guardian, child marriage is reintroduced, you will be disinherited. If you are raped it's your fault, and you will get stoned to death ... I reject Islamic law because it's inherently hostile to women. It is so bigoted. To applause from the audience, Hirsi Ali concluded: "We will not defeat and we will not eradicate these practices, unless we talk about the principle, and the principle is enshrined in the Islamic law, unreformed." Dutt would not relent. She pushed Hirsi Ali further by suggesting that in her own country of India, Hindu women were as excluded as Muslim women from places of worship. The response of a stern and visibly frustrated Hirsi Ali again drew applause from the audience. "We have 30 minutes to talk about women in Islam ... can we please, for just these 30 minutes, focus on the topic," she said. One of the most heated moments occurred when Hirsi Ali brought up the issue of child marriage, giving the example of Prophet Muhammad's marriage to Aisha, who Islamic scholars insist was only six at marriage, while the marriage was consummated when she was only nine. "That is Islamic law," Hirsi Ali asserted. That angered another panelist, leading to a later shouting match between the two that continued off stage after the event ended. It seems conflicts within Islam that began 1,400 years ago on the deathbed of Prophet Muhammad are going to be with us for as long as we Muslims remain oblivious to our surroundings.